This card resonates right into the core of my being. 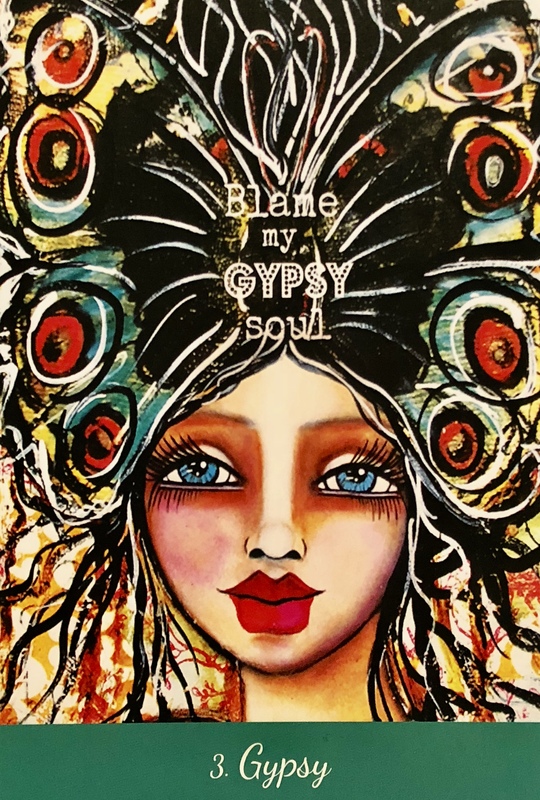 I am a Gypsy; heart and soul. I am a free spirit, an adventurer, a wander, a mystic a yogi and a seeker of truth. Sagittarius, the sign of the centaur. Freedom, expansion, philosophy. Gypsy. When I read those words my heart beats a little faster. My mind immediately conjures up ideas of exotic people and far flung places. Turquoise waters and secluded beaches, pristine coral reefs. Local flavours and secret places. Nature untouched. But alas, I am a mother, in the thick of it. It will be a while before my physical body can follow my heart on the adventures it craves. For now my freedom is in the moments between. Between working and picking up kids. Between the odd Saturday to Sunday that they go to their dad’s. Between the responsibilities, the obligations and the scheduled events. But I’m still a Gypsy. I can still anticipate adventure. I can still invite in new people from exotic places and dream about traveling to the far flung places. I can still express myself creatively and I can still conjure up excitement and adventure. I can wander through the woods or down the beach. I can choose to experience things differently; shift my perspective. And I can still say yes to the opportunities that come my way. Thank you ..this is so beautiful can I share theses messages ? I am a gypsy too. I resonate 1,000,000% with this posting!!! I am a Sagittarius ascendant and feel the exact same feelings you do when you read this card! Alll of a sudden the wind starts blowing in a tornado around me and the excitement is rising and then I just want to grab my backpack and go!! AHHHH!! !